The History of Granada is quite a fascinating one. 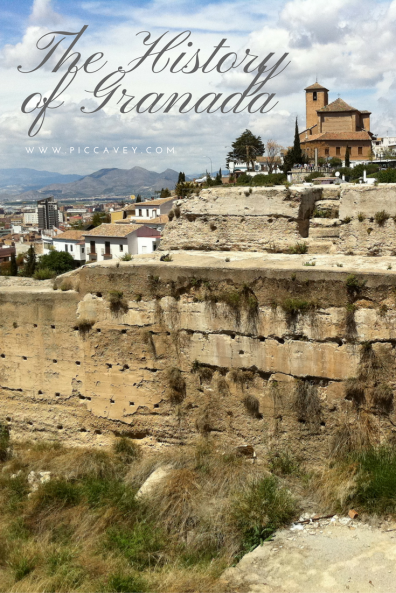 As with many historic cities, Granada was also a walled city at first. The city has had five different walled neighbourhoods over the centuries. The palatial city of the Alhambra, the Realejo neighbourhood and three different areas of the Albaicin. The Albaicin has been a site used for housing since the Iberians around the 6th century. Recently on a visit to the U.K, a walk around the Roman Walls in Chester gave me a great insight into the city´s history. 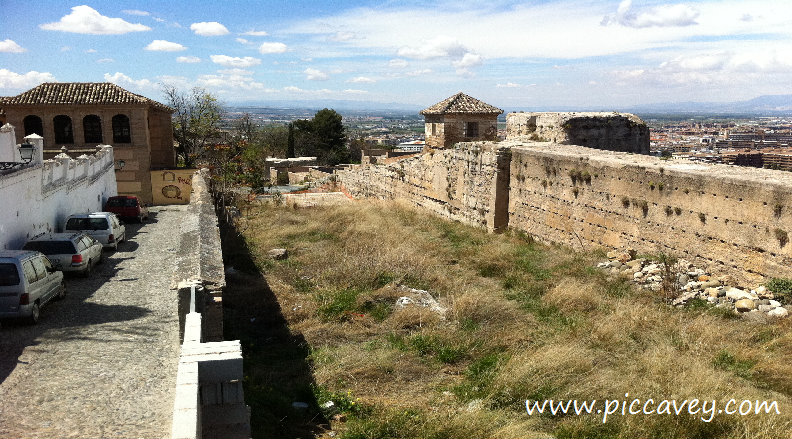 That got me thinking about the Old city walls of Granada. One of the things that captures my imagination is the Old Ziri Wall. 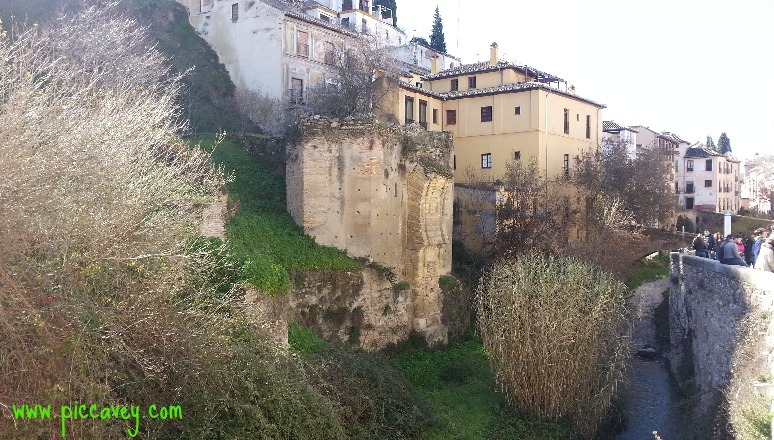 I would often come across of stretches of old walls and gateways in the Albaicin and Sacromonte. These historic ruins would always make me curious as to what they were. Some are accesible by pathways or streets, others are cordoned off or even bricked up. The Ziri walls are oldest walls left in the city and it´s a shame that they are cordoned off. There have been many attempts by authorities to conserve the walls. The authorities want to prepare them for visits. The official project has been planned for 16 years but the walls are still not open to visitors. Worse still they haven´t been restored or well maintained in the meantime. The restoration proyect includes wooden walkways and open public spaces set out along the length of the wall. I would love this project to materialise. Opening up this historic space for all visitors would also give another reason to wander through the Albaicín. This walled perimeter of the city dates back to the 11th century. This Muslim construction would have been next to the river Darro. 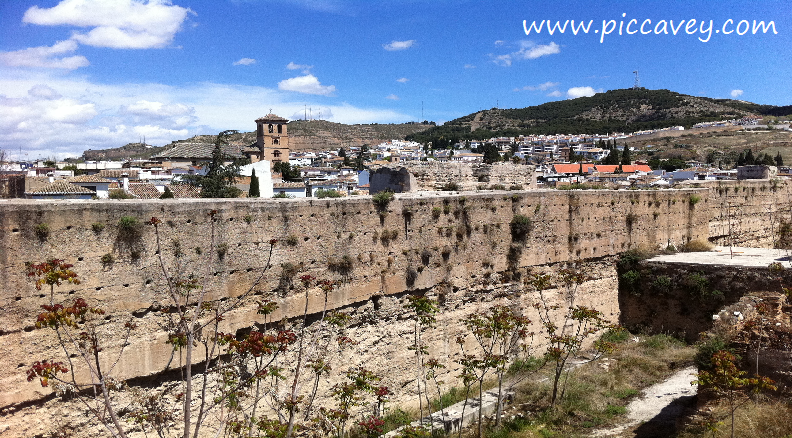 The length of the wall was built up to the settlement of the Albaicín neighbourhood, Historians estimate that it stretched over 8000m. Although we cannot take a circular route to see the whole wall nowadays, we can retrace some parts of the route. The largest single part of the Wall visible today is 350 metres long. This stretch of wall has 14 watchtowers along it. If we wander further along to the Plaza de Santa Isabel la Real. We discover another section of the wall. 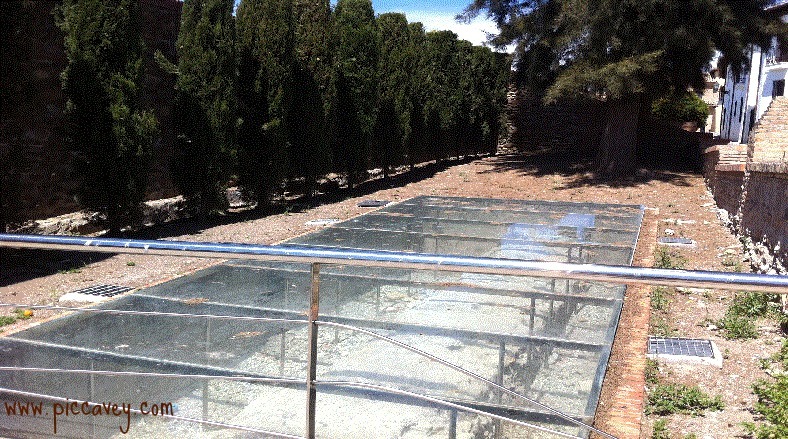 It is at ground level and is protected by transparent acrylic screens. If you didn´t know what it was you would easily miss it. It doesn´t look important at all and the ruin is only just visible through the weathered acrylic. This wall was built to protect the Qasaba Qadima o Alcazaba Vieja around 1013. Before the Ziris arrived here there was a Roman settlement known as Eliberri. Archaelogists have found parts of the Roman walls below the Ziri Wall in some sections. 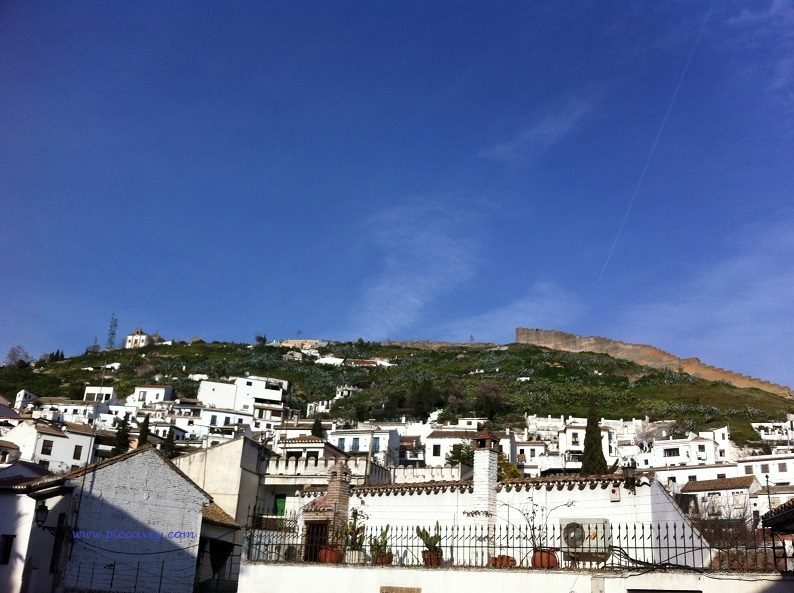 The Ziris were creating the Taifa of Granada at the time and created their settlement of La Alcazaba Cadima (al-Qasba Qadima) in the upper part of Albaicín. The Ziris chose this place close to the river Darro and cleared the previous buildings. This settlement would have had 4400 homes and was protected by the Ziri wall. As you wander around Granada you will see large horseshoe arches. These Archways or gates were set along different parts of the city walls. This way both merchandise and people could be controlled as they moved in and out of the city. It was also a great way to defend the settlement, at nightime the gates were closed. One of the best examples of these gates still here today is Puerta de Elvira. This impressive archway is close to Gran Via at the end of Calle Elvira. The original 11th Century Gateway is well maintained and leads onto one of the main streets in Granada today. Another example of a Ziri Gateway is Puerta Monaita. This sturdy construction stills stands but it is closed off and not in a good state of conservation. This was first known as Bab al-Unaydar and is located close to Carril de la Lona. This was the main entrance to the city at the time of the Ziri Dynasty. Another important Gateway in Ziri Granada was Bab al-Difaf on the Darro River. We can only see the remains of this, barely recognisable as an archway now. This tower shaped ruin sits on the riverbank, opposite the Bañuelo. It is also known as the Puerta de los Tableros and Puerta de Guadix Baja. This large archway and tower had access to fresh water below. From the palatial city above, water from the river was lifted up by a pulley system. The History of Granada spans over 1000 years, I enjoy discovering forgotten stories of this fascinating city… and hope you enjoy reading too. Amazing, thanks for this post. Shared! Thankyou Maria, it was interesting finding out all about this wall. Yes, walking along a wall can give you a real sense of a city’s history. Hope the walls are more accessible by the time I make my long-overdue visit to Granada. Sounds like investment in tourism has been hit by the credit crunch. I had a few nights in Granada a few years ago and although we wandered around the city, I had no idea that there were so many sets of walls – nor did I appreciate their age. I love the view of Puerta Elvira! Yes, the Puerta Elvira is just one of many city gates in the city, I am researching about all of them but it´s dense Reading. That´s for another day! This is really very interesting insight to Granada. I’ve not been familiar with any of it, so thanks for the education. I never cease to be amazed at how many Roman ruins are still being found today throughout Europe. Very cool photo of the beautiful (and imposing) main city gate. Thanks Cathy, it´s hard to get the gate and the detail in the shot, it´s huge and imposing! Interesting insights into Granada – it’s a shame that the oldest walls are cordoned off – I do see it from a preservation standpoint, but it’s getting very much to the point nowadays that you can’t get up close to anything ancient anymore. Hope that the walls do become more accessible, they’re so fascinating! Fingers crossed that they get going with the restoration Project, seeing other cities walls makes me jealous! I love to walk around city walls, wherever I am. I’ve also walked around the Roman walls in Chester, and the walls in Rothenburg, Germany, among other places.. There’s nothing like a walk around the walls to connect the past and the present. You get a real sense of the history of the place, as well as a different view of the today. Great stuff! Yes, it really gets the imagination going to think of everything those walls have seen over all the centuries!. I love cities with walls and city gates, these kind of cities are so fascinating with lots of history. I hope the walls will be completely restored by the time I visit Granada. Very interesting article. Thanks Freya, I´m looking forward to being able to walk up to those walls and see them restored one day. It would be a great asset to an already fabulous city. Hey Molly, Great insight into Granada. I did not know about the city walls, though I have been there. I stayed in the Albaicin and really loved it. I fancy it as a place I could see myself living. Yes, Granada ia a great city to live in, quality of life here is very good. Great local food and a relaxed day to day Schedule. I love these cities that have old walls. It’s not just that the walls themselves are cool, but it normally means the development within them has been limited. I was just in Morocco and found that with the medinas. You had a little time capsule within the walls – and it seems like it’s quite similar here!